Dashboard: Displays a list of membership and contribution together with limited information (similiar to CiviCRM). Contributions: Displaying all the contributions records associated for the logged in contact - only limited information. https://civicrm.org/extensions/ukcoartechconsultancymodulesmartcivi against your civicrm website site. Please use Read.Me file for more information regarding usage. Updating user information from mobile app to CiviCRM Database. Additional pages for Event, Case and Activities. Linking Event with Map and location. 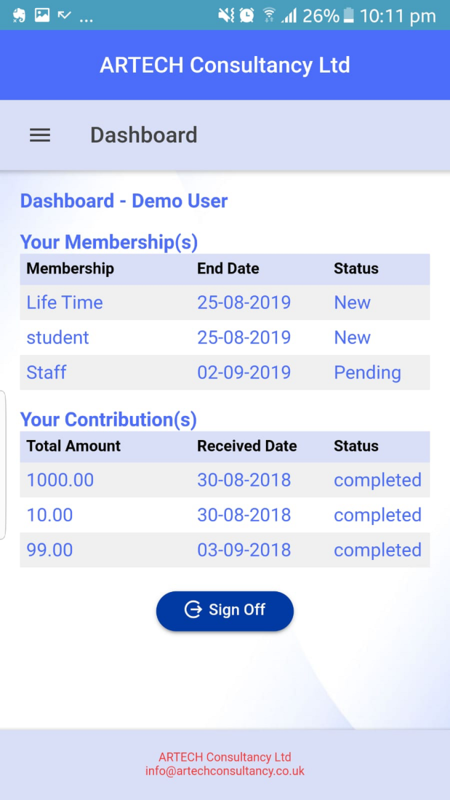 Please give a quick test of the smartcivi Android app and give me a feedback. Great to hear that you are working on a mobile app! I was wondering how your app relates to the work that Agiliway have done on creating a mobile app? Ramesh, in reading the previous comment I get the impression this app is intended for use by constituents and not just staff (eg, viewing my contributions). Are there any security issues with giving our constituents our Site Key? Most of ours are nice ;-) but who knows what they might do with that information? Where all the user will have limited rights - I will update the same against the extension.